I love old dressers. 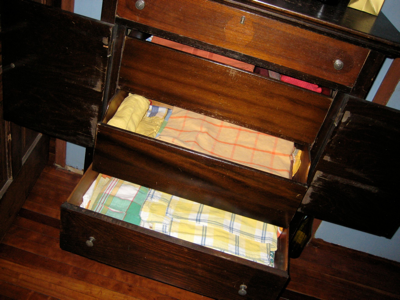 I have one in my dining room for storing my table linen and placemat collection (a collection I actually use). One in the basement for storing painting and drywall tools. One in the garage for gardening stuff. One in my studio for hand made paper. One in the family room for stuff; a drawer for electronic cords, a drawer for camera paraphernalia, a drawer for gift wrap. You can never have enough drawer space. With the plethora of organizing products and shelving systems for closets these days, the good ‘ole dresser has taken a back seat. And, horror of horrors, been replaced by the ugly plastic drawer sets on wheels. Now these might be handy, for sure. But they are made off shore out of non-renewable products. Bureaus are easy to find at second-hand stores and garage sales. Even beat up ones only need a coat of paint and a new life of usefulness springs forth. Who said dressers were for clothes! This entry was posted in News and tagged bureau, drawers, furniture, organizing, storage, table cloths on March 31, 2008 by nurturingspace.